I know people like to know the meaning (or at least the reasoning) behind tattoos & I don't really know what I can say for this one because the reason I got it is really complicated....even more so than last time lol. My last tattoo was for a very complicated but specific reason whereas this one is more tied into a whole load of little reasons. 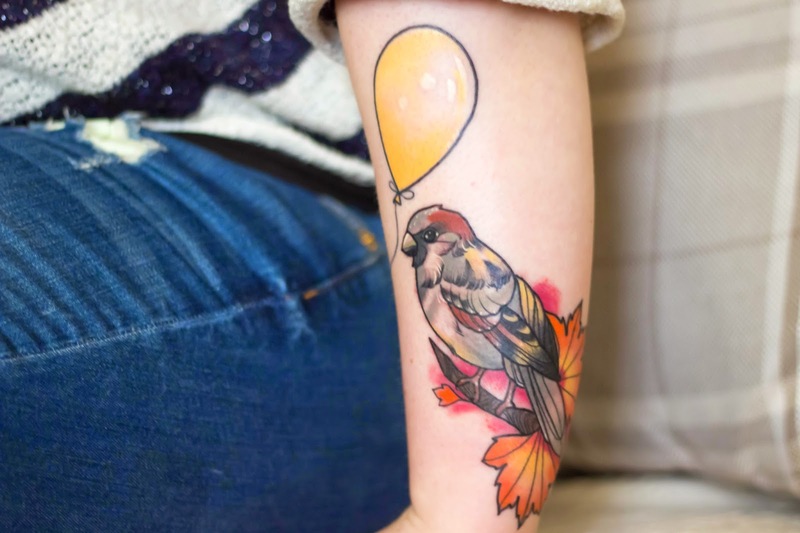 When I decided to get the balloon tattoo I knew it would not be my last, I've been planning tattoos since I was 14 so it was kind of inevitable, so I decided I would like them to have some kind of coherent theme & the one I settled on was one tattoo for each season so a spring floral one (or two ^^), the balloon is my summer one, autumn leaves for autumn & snowflakes for winter. Randomly the autumn leaves tattoo came, fully formed, with the house sparrow. House sparrows are tied into so many things for me - Paris, where there seem to be more house sparrows than pigeons, one of my favourite series of books as a teenager is full of house sparrows & my back garden which - despite being a tiny square of concrete, a ratty bush & a couple of delusional (& stunted) trees a dodgy stones throw from the city centre - feeds hundreds of house sparrows daily (and the odd sparrow hawk ^^). That is as close as I can come to explaining the logic behind my tattoo. I have a feeling that the way I will explain it from here onwards is "It's pretty & I like it". Ooh, it's beautiful! I have a peacock butterfly on my leg for kind of a similar reason - they're the ones that I've photographed the most and it just reminds me of being in the garden. When asked though I generally just say 'I like butterflies'. I want a robin too! Ooooo, I love the sound of your bird tattoos.